With words of hope and rousing calls to action, the fifth annual W.E.B. Du Bois Medals ceremony brought the stars to Sanders Theatre on Wednesday. 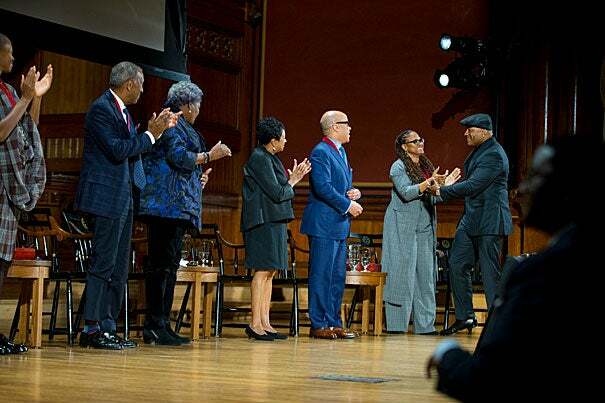 The eight honorees hosted by the Hutchins Center for African and African American Research included celebrities such as director Ava DuVernay, artist Kara Walker, Democratic political strategist Donna Brazile, and rapper and actor LL Cool J. But the awards, which recognize significant contributions to African and African-American history and culture, also saluted the lesser-known luminaries Carla Hayden, librarian of Congress; Darren Walker, president of Ford Foundation; John W. Thompson, chairman of Microsoft; and, posthumously, educator and activist Jennifer Ward Oppenheimer. The ceremony opened with a performance by the Kuumba Singers student group, a benediction by the Rev. Jonathan Walton, the Plummer Professor of Christian Morals and Pusey Minister in the Memorial Church, and remarks by Glenn H. Hutchins, whose family foundation has strongly supported the center. Honorees (from left) Kara Walker, John W. Thompson, Donna Brazile, Carla Hayden, Darren Walker, and Ava DuVernay applaud as LL Cool J rises to accept his Du Bois medal. Rose Lincoln/Harvard Staff Photographer. Introducing Walker, Martha Tedeschi, the Elizabeth and John Moors Cabot Director of the Harvard Art Museums, discussed the interaction of activism and art that informs Walker’s work. During a slideshow that traced Walker’s career from her early silhouettes through the monumental “A Subtlety” installation sculpted of sugar, Tedeschi announced that the museum had acquired a wall-size piece from Walker’s current New York gallery show. Walker, who acknowledged her reputation for saying a lot on paper rather than in person, simply thanked the center for the honor. Recognizing Thompson, Michael D. Smith, the Edgerly Family Dean of the Faculty of Arts and Sciences and John H. Finley Jr. Professor of Engineering and Applied Sciences, discussed the Microsoft’s leader’s patience and perseverance. Smith paraphrased Thompson’s belief that companies that lack diversity cannot meet the public’s needs. Thompson himself, the only person to hold the title of CEO besides company founder Bill Gates, offered a simple statement of thanks. Brazile made more use of the podium. Following her introduction by Douglas Elmendorf, dean of the Kennedy School and the Don K. Price Professor of Public Policy, the longtime Democratic operative launched into a fiery speech that ranged from her past working for presidential candidate Al Gore to the future. Returning repeatedly to the primacy of voting, she stressed the importance of voter registration and outreach. 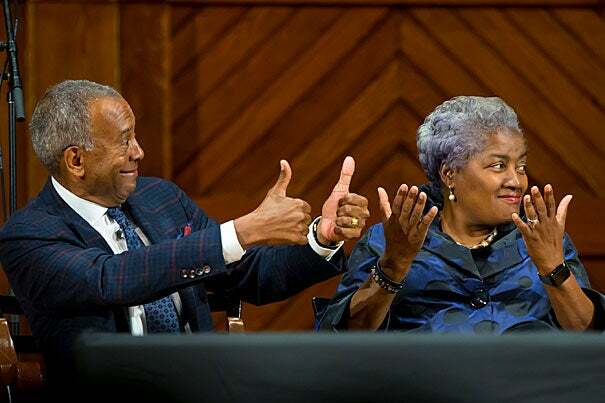 Recipients John W. Thompson and Donna Brazile react in the affirmative during a recipient’s acceptance speech. Rose Lincoln/Harvard Staff Photographer. Paulus’ introduction was followed by a short film compilation of DuVernay at work, with clips of such films as “Selma,” and ending with a trailer for her upcoming adaptation of “A Wrinkle in Time” that had the audience cheering. Marcyliena Morgan, professor of African American studies and director of the Hiphop Archive & Research Institute, showed her familiarity with LL Cool J’s work, referencing the rapper, actor, and educator’s mega-hit “Mama Said Knock You Out.” He acknowledged her tribute to him as an educator, revealing how important books and lifelong education are to him. He closed the speaking portion of the ceremony (a closing benediction and more music would follow) with a final call to action. The third annual HUBweek festival kicks off Oct. 10. Future Forum events will take place at the Hub, HUBweek’s first-of-its-kind centralized festival site in City Hall Plaza.